A few weeks ago, we were lucky enough to receive a visit from Jack Grieve, a researcher and lecturer from Aston University, England, who delivered a fascinating presentation: Tracking the emergence of new words across time and space, examining the emergence of new words on Twitter. Intrigued by what he had to say, Henry decided it would be a good idea to catch up with Jack for our first-ever twinterview, and fired a series of 140 character questions at him to find out more about his research. HF: Hi Jack, it’s nice to meet you. We’re going to try and do this all in 140 characters or less. Are you ready? Done anything like this before? JG: Really nice to be talking with you too. Every time I tweet I’m cramming things into 140 characters, so I guess I’ve got a bit of experience. HF: We’re very interested in your research on emerging words on Twitter. Can you summarise what it entails for those who haven’t seen you talk? JG: We’re using Twitter to find and track new English word formations as they enter the vocabulary of the general population for the first time. HF: What is your standpoint on the developments you describe? Are they signs of an advancement or regression in the way humans use language now? JG: I think every new word that’s added to a language qualifies as a sign of advancement as long as a better word wasn’t forgotten in the meantime. HF: Conducting the research, did you come across words or terms that completely flummoxed you? Did the whole process make you feel terribly old? JG: Most of the words are new to me so I have to work out their definitions by reading over examples. I’ve learnt not to trust Urban Dictionary. HF: It must be quite an arduous task! Let’s have some more examples: what are the most common words you’ve encountered that you can repeat here? 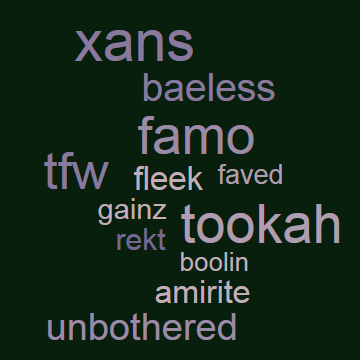 JG: Some of the top (clean) emerging words from 2014 are unbothered, rekt, tfw, xans, baeless, tookah, boolin, famo, faved, on fleek, and gainz. HF: That is quite a list. 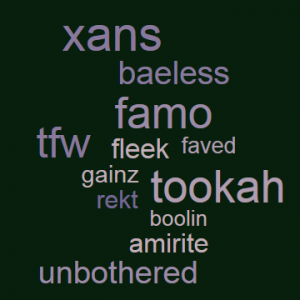 Perhaps they might one day end up in our Open Dictionary – like fleek did! So do you have a favourite one at all then? JG: My favorite is unbothered. Its meaning is not entirely clear, but it’s not just “not bothered”. It also implies being “happily oblivious”. HF: Thanks! And is there a particular word/expression you’ve started to adopt since becoming involved in this field of study? Tell us about it. JG: The only one I’ve worked into my regular speech is amirite*. It isn’t something I’d never said before but now it feels like one word. HF: You’ve primarily looked so far at the US. Any plans to conduct research in the UK to observe similar patterns? Or is it too small a country? JG: The UK’s up next! We’re also interested in how words spread between the UK and US and what might predict a new word’s likelihood of success. JG: I’m a lecturer at Aston University, my Twitter name is @JWGrieve, and you can find my academic website here. Jack Grieve is a Lecturer in Forensic Linguistics at Aston University in Birmingham, where he teaches English Language. His recent research focuses on using quantitative corpus-based methods to understand language variation and change. This research was conducted with Diansheng Guo from the Geography Department at the University of South Carolina and was funded by JISC/ESRC/AHRC as part of the Digging into Data Challenge, which supports research on data mining in the humanities.